Ardi's 125-piece skeleton includes the skull, teeth, pelvis, hands and feet bones. Scientists say the data collected from Ardi's bone fragments over the past 17 years push back the story of human evolution further than previously believed. 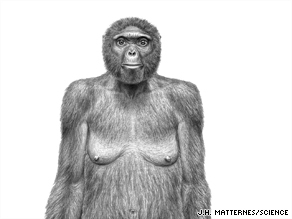 "In fact, what Ardipithecus tells us is that we as humans have been evolving to what we are today for at least 6 million years," C. Owen Lovejoy, an evolutionary biologist at Kent State University and project anatomist, said Thursday.